I spent much of yesterday morning over at Harvard's Houghton Library looking at books from the library of Dr. John Jeffries (1745-1819), at left. With the addition of those titles I've finished entering all the books known so far from Jeffries' personal library (782 titles). Jeffries is a fascinating character - trained at Harvard and the University of Aberdeen, he opened a medical practice in Boston in 1769, but his loyalist sympathies caused him to evacuate with the British in 1776; he served as a military surgeon, then moved to England and didn't return to America until 1789. Beginning a general medical practice in London, Jeffries did very well for himself, and soon began focusing on pediatrics and obstetrics. He was interested in scientific pursuits, and on 30 November 1784 financed a balloon flight with Jean Pierre Blanchard in Hyde Park, London. On 7 January 1785, Jeffries and Blanchard went further, crossing the English Channel from Dover and landing in France. The two were taken to Paris, where they were wined and dined (Jeffries even met with John Adams and Benjamin Franklin, to whom he delivered the first recorded air mail (having brought letters on the balloon). Jeffries returned to Dover on 27 February, and wrote up an account of his aerial voyages (later published). To settle certain family business, Jeffries returned to Boston in November 1789, where he was warmly greeted by his old friends (including John Adams, Elbridge Gerry, and others). Jeffries determined soon after to stay in Boston, and began a medical practice in April 1790. From then until his death in 1819, it is said that he delivered some 2,000 babies in Boston. Jeffries acquired a large medical library while he was abroad, and the catalog of that collection forms the basis of his LT catalog (the catalog, along with some of the books, are now at Harvard's Countway Library). But it was the non-medical books at Harvard that I went to see yesterday - these, I expect, were divvied up amongst Jeffries' surviving children (unfortunately we don't know exactly how many there were, but I'd certainly appreciate information from any corner on additional known Jeffries titles). Among the very interesting things I found yesterday: in a 1707 Bible Jeffries had cut his bookplate in two, using each half to sandwich the bookplate of a previous owner (in this case, that of Governor Joseph Dudley). That book was given to his daughter Catherine in March, 1819, a few months before the doctor's death. A copy of Jeffries' own publication about his balloon voyages was both unbound and untrimmed; the loose sheets could be unfolded to show exactly how they came off the printing press (a great way to demonstrate book production). But the set that really captured my interest (and could probably have kept me busy for hours if I'd allowed it to) was Jeffries' ten volumes of Shakespeare (London, 1785), the version edited by Johnson and Steevens (this version with revisions by Isaac Reed). I laughed at the price notation pencilled in front: "10 Vols, $10" (even ex-lib sets of this edition sell for $500 or more now). Either Jeffries or a another owner has tipped in hundreds of clippings about Shakespeare and his works, plus engravings related to the plays, and there are significant marginal notations in some portions of the text. 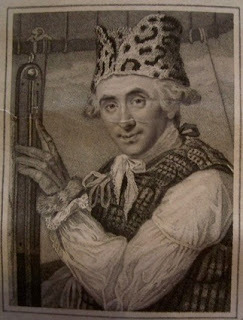 One of the first clippings tells a story also recounted by Dibdin, titled "Bibliomanic Rage," about the 1790 purchase of the Duke of Roxburghe's copy of the First Folio: "A singular story is extant about the purchase of the late Duke of Roxburghe's copy of the first edition of Shakespeare. A friend was bidding for him in the sale-room, his grace had retired to one end of the room, coolly to view the result of the contest. The biddings rose quickly to twenty guineas – a great sum in former times, when collecting was not quite so fashionable as it has since become; but the duke was not to be daunted or defeated. A slip of paper was handed to him, upon which the impropriety of continuing the contest was suggested. His grace took out his pencil; and with a coolness which would have done credit to Prince Eugene, he wrote on the same slip of paper, by way of reply: -- 'Lay on, Macduff! / And d----d be he who first cries 'hold, enough'!' Such a spirit was irresistible; it bore down all opposition, and was worthy of the cause in which it was engaged. The duke was of course declared victor, and he marched off triumphantly, with the volume under his arm.” The duke eventually had his book for 34 pounds and change (it's now at the Huntington Library). I started adding Jeffries' books way back in August (after having transcribed the catalog at Countway last winter), so it was fun to finally get a chance to turn some of their pages (and see some very intriguing bits of bibliographic history). Now, I hope others who know of additional extant Jeffries books will let me know of them, so I can be sure to keep the lists up to date. - Over at Bookplate Junkie, Lew Jaffe errs on the side of caution in the face of some serious eBay wishful thinking. - Bruce Sullivan writes at LISNews about the "Dewey Dilemma" faced by public libraries today. - Jon Michaud at Book Bench talks to Marilyn Johnson about This Book is Overdue! - Really awful news out of Virginia, where the legislature has proposed eliminating funding for the Virginia Foundation for the Humanities entirely in 2011. - Via The Bunburyist, I recommend the Library Company of Philadelphia's exhibit "Philadelphia Gothic" (the link takes you to the very nice online version). - Louis Menand's The Marketplace of Ideas: review by Anthony Grafton in The New Republic. - S.J. Parris' Heresy: review by Anna Mundow in the Washington Post. - Laurie Scheck's A Monster's Notes: review by Miriam Burstein at The Little Professor. - Clare Clark's Savage Lands: review by Sybil Steinberg in the Washington Post. - An Investigation of Mr. Malone's Claim to the Character of Scholar, or Critic, Being an Examination of his Inquiry into the Authenticity of the Shakspeare Manuscripts, &c. by Samuel Ireland (reprint published by Augustus M. Kelley, 1970). Adams Avenue Bookshop, via Biblio.com. - Chalmeriana: or, A collection of papers, literary and political by George Hardinge together with Mr. Ireland's Vindication of his Conduct Respecting the Publication of the Supposed Shakespeare Mss. Being a Preface or Introduction to A Reply to the Critical Labors of Mr. Malone in his "Enquiry into the Authenticity of Certain Papers" by George Steevens (reprint published by Augustus M. Kelley, 1971). Powell's Bookstore, via ABE. - Anathem by Neal Stephenson (Harper, 2009). Trident Bookstore. I managed to win Biblio.com's Twitter "Book Hunt" on Friday - any suggestions for what I should use the gift card on?! Some more court action in our other British book thievery case: William Simon Jacques was in court on Thursday and he, like Raymond Scott, also entered a not guilty plea. His trial is set for the week of 4 May. I've added a couple new Libraries of Early America: those of John Oxenbridge (1608-1674) and his third wife, Susanna Abbott/Abbit Oxenbridge (d. 1696). Their wills are printed in Henry F. Waters, Genealogical Gleanings from England, Vol. I (Boston: NEHGS, 1901), pp. 420-423, and each outlines a number of gifts of books. Although the collections are small in terms of titles, there are some tantalizing clues that at least Susanna might have had some additional books (though they are not disposed of in her will). John's will makes clear that Susanna is to keep the "bookes she had in her former widowhood," and some gifts she provides seem to indicate that the recipients will be able to make a selection (Rev. James Allen is given one book by name, plus "fowre more att his choice", while Mr. John Davie is granted "a good booke"). Interestingly, of the eight recipients of books named in Susanna's will, five are women (Mrs. Sarah Davie, Mrs. Bellingham, Mrs. Hodges, Mary Taylor, and Sarah Gent). I'm hoping that there might be inventories for these estates, and may find some additional titles if there are. Stay tuned! The BBC reports that accused book thief Raymond Scott had a court date today, and that he entered not guilty pleas to the charges of theft, handling stolen goods and removing criminal property. The trial is still planned for mid-June. Well, the New York Times might not have been able to resist the pull of the punny headline, but I can. An important 1641 Descartes letter, stolen from the Institut de France in the mid-19th century, will be returned after it was discovered in the collections of Haverford College. The story of the original thefts, by Guglielmo Libri, is a fascinating one, and I hope to have more to say about it shortly. The Boston Public Library will host a reading and discussion of Phillis Wheatley's poems, on Thursday, 25 February at 7 p.m. Scholars will "discuss Phillis Wheatley as the First Lady of African-American letters, and what she has to say to writers regardless of race or ethnic background. The reading and discussion will examine her life as an experience that not only speaks to us today as writers, but as the greater achievement of a woman and slave writing in a language that was, like herself, finding its own identity as a nation." - Mount Vernon has announced a record $38 million gift from the Donald W. Reynolds Foundation to construct a 45,000-square foot research library, slated to open late next year. The library will be known as the Fred W. Smith National Library for the Study of George Washington. - Washington College has unveiled the shortlist for the 2010 George Washington Book Prize, a $50,000 award. Contenders are Richard Beeman's Plain, Honest Men: The Making of the American Constitution; R.B. Bernstein's The Founding Fathers Reconsidered; and Edith Gelles' Abigail & John: Portrait of a Marriage. - Descartes was murdered, a German scholar believes. Another scholar believes he's found evidence that Robert Dudley's wife Amy was probably murdered too. - A new exhibit at Washington & Lee University, "Beyond Text & Image: The Book as Art." The show opens on 25 February. - And a new exhibit at my alma mater, Union College: "Dickens in America," which will run through early April. - The French government has purchased the 3,700-page manuscript of Casanova's memoirs. BNF head Bruno Racine said it was "the most important purchase ever made by the library." - Book Patrol has a new report on the "mummy paper" question. - A CA paper profiles Auburn collector Bill Ewald, who has almost 700 different editions of Richard Henry Dana's Two Years Before the Mast. - Voting's now open for the 2009 Diagram Prize (weirdest book title). Go here, and the poll's about halfway down on the left margin. Here's some background on the shortlist. - The Harry Potter plagiarism claims live on, the Telegraph reports. - Salon's Jed Lipinski talks to Marilyn Johnson about her new book, This Book is Overdue! - Writing in the NYRB, Jason Epstein offers some hints into the future of the publishing industry. - Hilary Mantel's Wolf Hall: review by Christopher Hitchens in The Atlantic. - Perez Zagorin's Hobbes and the Law of Nature: review by Jeffrey Collins in the WSJ. - McSweeney's Issue 8; edited by Paul Maliszewski (McSweeney's, 2002). Harvard Bookstore. - The Clerkenwell Tales by Peter Ackroyd (Anchor, 2005). Raven. - Interred with Their Bones by Jennifer Lee Carrell (Plume, 2008). Harvard Bookstore. - Trickster Travels: A Sixteenth-Century Muslim Between Worlds by Natalie Zemon Davis (Hill and Wang, 2007). Harvard Bookstore. - The Travels and Journal of Ambrosio Bembo; translated by Clara Bargellini; edited and annotated by Anthony Welch (University of California Press, 2007). Raven. - Anthill: A Novel by E. O. Wilson (W.W. Norton, 2010). Publisher. - The Two Hendricks: Unraveling a Mohawk Mystery by Eric Hinderaker (Harvard University Press, 2010). Amazon. - This Book Is Overdue! : How Librarians and Cybrarians Can Save Us All by Marilyn Johnson (Harper, 2010). Amazon. - A Reader on Reading by Alberto Manguel (Yale University Press, 2010). Publisher. - Mrs. Adams in Winter: A Journey in the Last Days of Napoleon by Michael O'Brien (FSG, 2010). Publisher. - In the Eye of All Trade: Bermuda, Bermudians, and the Maritime Atlantic World, 1680-1783 by Michael Jarvis (UNC Press, 2010). Publisher. With the addition of 41 titles from Princeton University last night (the ones which started the ball rolling thanks to the eagle-eye of Steve Ferguson), the Thomas Shepard Library in LibraryThing is complete to date (see this post for background on the project). We've currently identified 160 titles belonging to the Thomas Shepards, and we suspect there are still more out there. So keep an eye out for that "TS" stamp/brand on the top edge, and please let us know if you find any examples! The "fairness hearing" on the proposed Google Books Settlement was held today in New York. At the outset, Judge Denny Chin said he would not make a ruling today. Library Journal has a rundown of the testimony heard this morning, which included the lone librarian speaking on the settlement (Paul Courant of the University of Michigan, speaking in favor of the settlement). More later as the afternoon's testimony comes down. The Globe follows up on yesterday's story about potential cuts to the BPL system, reporting that one of the proposals being floated would close 10 of the neighborhood branches and reduce staff by 25%. President Amy Ryan said the only alternative would be drastic cuts in services, leaving some branches open only one day per week. The library's budget shortfall for next year is expected to near $3.5 million. No decisions have been made, but trustees said that criteria for branch closures are being considered. They guaranteed that the process will be open and that final determinations will be made early this spring. Circulation of BPL materials has risen 31% over the last three years. The Boston Public Library's trustees meet this morning to discuss possible service cuts after a nasty drop in state funding, the Globe reports. Once we know what they've decided on I'm sure there'll be more to say about this. Book Review: "McSweeney's, Vol. 33"
The 33rd installment of McSweeney's Quarterly Concern comes in the form of The San Francisco Panorama, a full-size Sunday-style newspaper. An enclosed informational pamphlet on the publication notes that the editors wanted to show all the various things for which large-scale print newspapers may still be not only a viable form but also the most appropriate. They write at one point "This process has provided great insight into the magnificent operations that daily newspapers do. How they do this every day we will never know. That they must continue has never been clearer." This newspaper was designed as a way to allow writers to "go deep," and there are several long-form pieces of journalism here, including an encyclopedic article by William Vollman on a battle between mining interests and Native Americans, a long essay on the Afghan elections, and a report on the Bay Bridge renovations (through a partnership with the non-profit SF Public Press project). Shorter journalism pieces include an article on a disastrous real estate strategy in SF, and as good an infographic on the Congo military conflict as any I've seen. Like any newspaper, this includes several key sections, including Sports (profiles of some SF teams, plus a very funny 8-page retrospective on the 2009 World Series written by Stephen King); food (a full-page illustrated procedure manual for butchering a lamb, a piece on SF's farmers' markets, and L.E. Leone on "roadkill stew"); comics (all original pieces, including "Sorro, The Gloomy Bandit") and a 3-D crossword puzzle. The Arts section included a very funny look at the differences between movie posters and DVD covers, and an essay by Kevin Collier on participating in t.v. studio audiences. The 112-page stand-alone magazine section included some excellent writing, including a day-by-day account of hiking Spain's Camino de Santiago, a profile of the AK muckraker who dogged Sarah Palin's gubernatorial term, and some interesting short features, including a call for the penny's value to be increased to 2 cents, and Chip Kidd making some suggestions for a redesign of the Amtrak ticket. In the 96-page book review section, also standalone, along with a tremendous selection of reviews, the editors have included a list of book titles translated into other languages and then retranslated, with hilarious results, several pieces of new fiction (including a story by Roddy Doyle) and an essay on choosing the cover models for romance novels. All told, the package contains 120 broadsheet pages, plus 96 pages in the book review and 112 pages in the magazine. The year-long project brought in more than 200 contributors, and must stand, in these difficult times for the form, as a monument to the overstuffed Sunday newspaper that continues to have so much potential. Book Review: "The Devil in the Holy Water"
The Devil in the Holy Water, or the Art of Slander from Louis XIV to Napoleon by Robert Darnton (University of Pennsylvania Press, 2009) is a dense, detailed and utterly captivating history of French libelous publications in the second half of the 18th century. In pre-Revolutionary France, where publishing was tightly controlled (by 1789 the government employed nearly 200 censors, Darnton reports) these anonymous texts (described as "slanderous, tendentious, wicked, indecent, and very good reading", p. 4) were important enough (and sold so well!) to warrant significant attention from those at the highest levels of power in the French government. Darnton's book, he writes, is designed to "explore this body of literature and the subculture that generated it" (p. 5). He adds "The study of slander in eighteenth-century France is particularly revealing because it shows how a literary current eroded authority under an absolute monarchy and became absorbed in a republican political culture ...." (p. 6-7). He begins by offering close visual and textual readings of four interconnected libels, which enable him to trace the trajectory of the genre and provide a useful case study of the cast of characters, conventions used by the authors, &c.
The examples Darnton chooses couldn't have worked better: stretching across the time period under consideration, they offer a wide range of authorial and typographical choices, and allow him to branch out for interrelated expositions at well-paced intervals. This section of the book is accompanied by excellent complementary illustrations, which enhance the text particularly well. Following the case studies, Darnton reaches more deeply into various components of the story. His examination of the London colony of French libelers and the efforts by the French authorities to put an end to them reads like a thriller novel, complete with undercover agents, (sometimes double and triple agents); bribes; blackmail efforts; attempts to rewrite English law, &c. Darnton's interest in the smuggling industry (which got the printed libels into France) is obvious, and his enthusiasm is infectious. But Darnton doesn't limit himself to the stories. His strengths as one of the greatest interdisciplinary historians of the book are on full display here: he offers a close bibliographical reading of the ingredients of libels themselves (basically gossip, despotism, and depravity; also, the pages on plagiarism remind me of Lawrence Lessig's "remix" idea), the publishing industry which brought these libels into being, works toward an understanding of how the libels were received by the reading public (strong conclusions are not possible here given the lack of evidence, but he is able to reach some tentative conclusions), and delves deeply into the political and social history of France to point out the important ways in which these texts served to undermine the Ancien Regime. By attacking the personalities of those in power (up to and including the king and queen themselves), and feeding the hunger of the news-starved people for information, the example of these libels, he concludes, help us "understand how authoritarian regimes can be vulnerable to words and how well-placed words can mobilize the mysterious force known as public opinion" (p. 445). This book also offers various points of focus for future study: Darnton points out Les Bohemiens, the fascinating novel and utterly forgotten Shandyesque novel written by imprisoned libeler the Marquis de Pelleport (anybody up for translating? [update: never mind, Penn's published it - good for them! ), and his contrast between the English reaction to libel and the French is certainly fascinating, among others. Not a light read, but well worth the effort. - Over at bookn3rd, Laura's started a series of posts on birds imagery in medieval manuscripts. I love this sort of thing, and will be waiting impatiently for the next installments. - Tony Campbell notes that actor Fred Melamed told New York Magazine that he's writing a screenplay based on the Smiley map thefts. - Countway's Jack Eckert reported on ExLibris this week: "The Center for the History of Medicine has joined with peer libraries to initiate a digital Medical Heritage Library. The Center will receive $400,000 over the next two years to digitize 10,000 rare books from the sixteenth to the twentieth centuries that relate to the intersection of medicine and society. The initiative is funded by a $1.5 million award from the Alfred P. Sloan Foundation to the Open Knowledge Commons, a nonprofit organization dedicated to building a universal digital library for democratic access to information." - J.L. Bell pours some more cold water on the "Constitution draft" news story that made the rounds last week. - From BibliOdyssey, some lovely engravings of moths. - A great project at Providence Public Library, where Rick Ring reports they're making a database of printer/bookseller/publisher images (about 1,000 of them!). - There's a new exhibit at the Yale Law School library: "Reused, Rebound, Recovered: Medieval Manuscript Fragments in Law Book Bindings." It will run through May 2010. - Libraries & the Cultural Record and its predecessor titles (Libraries & Culture and Journal of Library History) are now entirely available through JSTOR (with a subscription). - Their owner has identified the original plantation ledger and several diaries used by William Faulkner as a source for names and themes in his novels. Sally Wolff-King, a lit professor at Emory, will be publishing a book on the findings in June (Ledgers of History: William Faulkner, an Almost Forgotten Friendship, and an Antebellum Diary). The original documents are now held at the University of North Carolina. - Marilyn Johnson, This Book is Overdue: review in the Boston Globe. - Mary Beard, It's a Don's Life: review by Anthony Grafton in The New Republic. - Woody Holton, Abigail Adams: review by Rosemary Zagarri in the Washington Post. - Kathryn Allamong Jacob, King of the Lobby: review by Jonathan Yardley in the Washington Post. - Michael Kranish, Flight from Monticello; review by Robert K. Landers in the WSJ. - Samuel Cohn, Jr., Cultures of Plague; review by Lauro Martines in the TLS. - Peter Carey, Parrot and Olivier in America: reviews by Robert Epstein in the Independent; Lucy Daniel in the Telegraph; Andrew Taylor, also in the Independent. Book Review: "The Mercury Visions of Louis Daguerre"
I seem to be on a bit of a historical fiction kick lately, the latest of which is Dominic Smith's debut novel The Mercury Visions of Louis Daguerre (Washington Square Press, 2007), which takes as its main protagonist Louis Daguerre, with cameo appearances by Charles Baudelaire and other historical personalities. The book is framed around Daguerre late in life, driven mad by mercury poisoning and convinced that there are certain things he must photograph before the world ends. Among the items on his "Doomsday List" is Isobel Le Fournier, who, we learn, was Daguerre's first (and only) love. Much of the novel is given over to flashbacks of their early days together and the circumstances of their parting, as well as his attempt to find her again before it's too late. While there were few surprises about the trajectory this book took, I liked the descriptions of Daguerre's photographic experiments and processes, and as characters he and Isobel worked nicely together. The descriptions of the difficult times in France during the late 1840s were well done, and Smith can turn a good phrase. - The Curse of the Voynich: The Secret History of the World's Most Mysterious Manuscript by Nick Pelling (Compelling Press, 2006). Author. - The Boston Library Society, 1794-1994: An Exhibition of Portraits, Views, and Materials Related to the Foundation of the Society and some of its Early Members by Michael Wentworth with Elizabeth Lamb Clark (Boston Athenaeum, 1994). Publisher. - A Selection From Our Shelves: Books, Manuscripts and Drawings From the Philip H. and A.S.W. Rosenbach Foundation Museum by Clive E. Driver (Rosenbach Foundation, 1973). Commonwealth. - Shakespeare: The World as Stage by Bill Bryson (Atlas Books, 2007). Commonwealth. - Milton in America by Peter Ackroyd (Nan A. Talese, 1997). Commonwealth. - Chatterton by Peter Ackroyd (Grove Press, 1996). Commonwealth. - The Plato Papers by Peter Ackroyd (Anchor, 2001). Commonwealth. - Irish Booksellers and English Writers, 1740-1800 by Richard Cargill Cole (Mansell, 1986). Commonwealth. - Write my review of the two-volume Oxford Companion to the Book for the April (print!) issue of Fine Books & Collections. - Make some serious progress in my current capacity as one of three non-fiction judges for the Massachusetts Center for the Book's 2010 non-fiction prize (the tenth year of the award). We received 58 books for this contest, and are charged with creating a shortlist (see last year's here) and then a winner, based on these guidelines. I'm pretty excited about this project - among the books are many I probably wouldn't have picked up otherwise, so it's nice to be able to read in areas outside my usual zone of focus. - Catch up on housekeeping for the LibraryThing Legacy Libraries project, including creating a breakdown of the subjects by home country, among other things. - Plug through some more of Dr. John Jeffries' library. Book Review: "The Lambs of London"
Peter Ackroyd's The Lambs of London (first published by Chatto & Windus, 2004) is about Charles and Mary Lamb (the brother-sister duo best known for their Tales from Shakespeare, published in 1807). But just as much or more, it's about William Henry Ireland and his Shakespeare forgeries. While the Lambs and Ireland never met in real life, Ackroyd brings the characters together in the mid-1790s, using Ireland as a clever way to explain some of what's going in Mary's head when she ... well, if you don't know what she does, you'd better read the book. Having known about the forgeries from the beginning it was interesting to see how Ackroyd worked up to the big reveal. Less satisfying were the strange ways he changed things around, making Edmond Malone a defender of Ireland's "discoveries" instead of the scholar who debunked them. Little things like that, as well as changing dates around (having Mary die in 1804 instead of 1847, and making her, Charles and Ireland seem much closer in age than they were). For all my quibbles with the way he did it, I loved the book. Charles and Mary's senile father with his random jabberings provided some excellent comic relief, and Samuel Ireland (William's Shakespeare-obsessed and ever-gullible father) were really good characters, and watching William Henry Ireland himself go through the process of disguising, dissembling and eventually confessing his actions made for fascinating reading. I think I might finally pull his Confessions off the shelf now. In the Worcester Telegram, columnist Albert Southwick discusses Woody Holton's new biography, Abigail Adams, and the Adams family papers: "We can be thankful that the Adams tribe was so addicted to writing. Letters, diaries, pamphlets, commentaries and books poured from their quill pens. There are more than 2,000 letters between John and Abigail alone. They discussed national and international events, along with the mundane details of everyday life. Theirs was one of the great love stories of American history." An interesting auction in Maine yesterday at James D. Julia auction house, where some Washington-related items which passed down through the family of Tobias Lear were up for sale. The one that's attracted the most attention is a map of the Yorktown battlefield, which sold for a surprising $1.15 million. This is being called "a record price paid for any antique sold at auction in the state of Maine, a record price for any item sold by James Julia, a record price paid at auction for an American map and believed to be a record price paid for a map worldwide. The buyer was characterized as a 'private individual with close ties with a museum.'" As Tony Campbell pointed this this morning in a MapHist email, it is certainly not the record for a map (both Ricci and Waldseemüller, among others, were significantly higher). Of more immediate interest to me was another item, part of Lot 2135, a list of books titled "Catalogue of Books received from Washington." It's important to note that this does not mean George Washington, though (several of the first few books on the list weren't published until after his death, for starters). Two of the lots contain early notes that indicate they came to Lear from George Washington (including a set of encyclopedias we know Washington bought and planned to give as a gift). Other titles, however, are stated to have come from Washington's library without such notes and without appearing in the inventory of that collection taken at Washington's death. None contain Washington's signature, as many of his books did. Their appearance in the "Catalogue of Books received from Washington," should not be a sign that they belonged to Washington himself. I hope the buyers of those (some of which went for fairly hefty sums) knew what they were getting. Forrest R. Smith, 48, who pled guilty in May 2009 to three counts of wire fraud and one count of mail fraud for using eBay to sell copies of books containing forged signatures, has been sentenced to 33 months in prison. He's also been ordered to pay $120,000 in restitution. Prosecutors had asked for a 33-41 month sentence, while Smith's lawyers and his family asked for a much reduced jail term. Some really interesting news from University College London's Bentham Project, which is set to launch the Bentham Papers Transcription Initiative, "a highly innovative and novel attempt to aid in the transcription of Bentham’s work. A digitisation project will provide high quality scans of the papers, whilst an online transcription tool will be developed which will allow volunteers to contribute to the transcription effort: providing a 'crowdsourcing' tool which will be used to manage contributions from the wider audience interested in Bentham’s work, including school students, and amateur historians." More info here. It will be really fascinating to see how this works, and whether a crowdsourcing model proves workable for other transcription projects. Book Review: "The Bad Book Affair"
Ian Sansom's fourth installment in his Mobile Library Mystery series is The Bad Book Affair (Harper, 2010). I rather wish Sansom would just drop the mystery business, since as in prior installments the mystery in question wasn't much of one at all. And this time around I thought Sansom tried to throw in a few too many minor plotlines, not all of which came together in a satisfying way at the end. That said, the best part about these books has always been the strange culture of Tumdrum, the Northern Ireland town where our pathetic hero (the English-Jewish-vegetarian mobile librarian Israel Armstrong) plies his trade, eats bad scones, and tries to keep out of trouble with the law. Armstrong's more depressed than ever in this book (recently dumped, almost 30, migraines to boot), and his colleague Ted's just as unsympathetic as usual. But the daughter of a local politician's gone missing, and naturally Israel finds himself unwittingly involved in the investigation. Ted and his Tumdrum companions (including here the elderly and deranged bibliophile Pearce Pyper, the only slightly-less-deranged Bible-quoting Mr. Devine, and Israel's landlady George) are what make these books bearable, and Sansom's characterizations of them continue to improve. Unfortunately the quality of the mysteries seem to stay about the same. - The San Francisco book fair is this weekend: Ian's offering dispatches from the floor, and you can also follow along with him on Twitter. - 2009 was a good year for odd book titles, apparently. The Bookseller's "Oddest Book Title of the Year" has drawn a record number of nominations, the Independent reports. The shortlist will be announced on 19 February. - The deadline for feedback on the Google Books Settlement has passed. The Open Content Alliance rounds up the objections, and Publisher's Weekly covers the continued reservations expressed by the Department of Justice. The fairness hearing is set for 18 February. - LISNews announced a "Librarian Essay Contest" for the month of February: anything concerning issues related to libraries. - The BL is offering more than 65,000 19th-century lit titles for free download this spring, through a massive digitization project. - From Past is Present (the AAS blog), an invitation to participate in a collaborative glossary project. Good fun! - I confess, I honestly don't see the fuss that's surrounded this story: researcher finds document that's right where it should have been? - Clare Clark's Savage Lands: review by John Norton in the NYTimes. - Michael Hunter's Boyle: Between God and Science: review by Michael Dirda in the Washington Post. - Bill Bryson, ed. Seeing Further: review by Emma Everingham in The Scotsman. - Elizabeth Kostova's The Swan Thieves: review by Frank Wilson in the Philadelphia Inquirer. - Michael Kranish's Flight from Monticello: review by David Waldstreicher in the Boston Globe. - Prospero's America: John Winthrop, Jr., Alchemy, and the Creation of New England Culture, 1606-1676 by Walter W. Woodward (UNC Press, 2010). Publisher. - As If an Enemy's Country: The British Occupation of Boston and the Origins of Revolution by Richard Archer (OUP, 2010). Publisher. In an email to supporters today, staff of the State Library of Massachusetts said "We are pleased to let you know that $170k has been reinstated to the library's FY2010 budget. Additionally, the Governor's FY2011 Budget Recommendation proposes a $684k appropriation for the State Library. The Governor's Budget Recommendation is the first in a series of steps in the budgetary process, which is explained on the state's website." Previous statements from the governor had suggested that the library might be closed. BibliOdyssey's post today highlights the Dresden Codex, believed by some to be the oldest known book produced in the Americas. Book Review: "31 Bond Street"
Taking a real-life 1857 New York City murder case as her inspiration, Ellen Horan has written a book that lets me use one of my favorite biblio-adjectives: "unputdownable." 31 Bond Street (coming in April 2010 from Harper) dramatizes the sensational murder of Dr. Harvey Burdell, and the ensuing trial of his mistress Emma Cunningham. Horan's simplified some aspects of the case and fictionalized others, but in telling the story by interspersing sections on Cunningham's trial with flashbacks to the days around the murder, she's made a creepy, coherent narrative out of it that manages to keep the twist obscured until the last possible moment. This reminded me of works by Caleb Carr, another writer who's able to create richly-textured historical crime fiction that has the power to absolutely creep me out and keep me up at night until I've read all the way to the end. A good diversion for fans of this genre - recommended. Back in November I noted that a body of FDR papers might soon be available to researchers after a law was passed waiving NARA claims over the documents (on condition that they then be donated to the NARA-run FDR Presidential Library). President Obama signed the law this week, but now, the NYTimes reports, a bankruptcy filing by the papers' owners (Sun-Times Media Group) may throw a major wrench in the works. Officials for the company says the donation should still go forward, bankruptcy proceedings, but that it "could take some time." In this month's "Americana Exchange," an overview of 2009 by the book auction numbers, a page-turner version of Chris Lowenstein's super-amazing Dante catalogue (now in the wild! ), and the usual variety of other features. And the February "Fine Books Notes" is up too - it includes a handy guide to bookish places in San Francisco, Nick Basbanes on films about books, a conversation with thriller writer Steve Berry, a review of Alberto Manguel's new A Reader on Reading, and more. The curators of "The Raven in the Frog Pond: Edgar Allan Poe and the City of Boston," on display now at the Boston Public Library, will lead tours of the exhibit on Thursday, 4 February at 6 p.m. and Saturday 13 February at 3 p.m. (each led by Paul Lewis); Saturday 21 February at 3 p.m. (led by Rob Velella), and Saturday 6 March at 3 p.m. (led by Paul Lewis). The tours will last about 45 minutes. The exhibit is in the Cheverus Room (third floor, McKim Building). Also, on Thursday 18 February at 6 p.m. New Yorker cartoon editor Robert Mankoff will join Paul Lewis for "What's So Funny About Edgar Allan Poe? ", an"exploration of humor by and about Edgar Allan Poe. Beyond his dark tales, in which humor is frequently mixed with fear or madness, Poe wrote satires, parodies, and putdowns, some of which were aimed at Boston and its writers. As a familiar figure in New Yorker cartoons, Poe (like the Grim Reaper) provides occasions for joking about things that go bump in the night." That'll take place in the BPL's Abbey Room (second floor, McKim Building). Laura Miller's Salon post "Kindle Killer" is the best dissection I've seen yet of the Amazon-Macmillan feud and what it means for the future of e-books, the Kindle, and the iPad's role in the next round. Book Review: "My Life with the Lincolns"
One of the forthcoming books that was getting some pretty significant buzz at the ALA Midwinter meeting among the publishers was Gayle Brandeis' My Life with the Lincolns (Henry Holt, coming out in mid-March). Being a sucker for a good YA story now and then, I was happy to receive an ARC, which I spent the last two evenings (and as much of the intervening day as my spare moments allowed) devouring. It's 1966, and Mina Edelman (12) believes her family are the Lincolns reincarnated. Their names and ages match nicely (Mina's short for Wilhelmina, and her sisters are Roberta and Tabitha, called Tabby - just about as close as you can get to Robert, Willie, and Tad; her parents are Abraham and Margaret). Mina takes it as her goal to make sure her dad doesn't get murdered like his prior iteration, and is convinced she's going to die a horrible death just like young Willie did (this preoccupation brings about some of the funnier and more disturbing elements of the plot). When Mina's dad gets involved with the Chicago Freedom Movement, and begins taking her to Martin Luther King, Jr. rallies, protest marches, and organizational meetings, her world - and that of her entire family - expands in some new and unexpected ways. Like Gary Schmidt's The Wednesday Wars, this book tackles some serious issues - Vietnam, racism, family tensions - but does so while capturing in a truly special way the mindset of a young person caught up in events larger than herself. At once funny, sad, and inspiring, this is a book that's going places. - On Wednesday, 3 February at 4:30 p.m. he'll deliver the Finzi-Conti Lecture at Yale's Whitney Humanities Center. Manguel's talk will be "Borges and the Impossibility of Writing." - On Friday, 5 February, Manguel will appear at the CUNY Graduate Center in NYC at 6:30 p.m.
- On Wednesday, 10 February, Manguel will take part in "A Translator's Choice: A Reading of Three Stories Translated by Alberto Manguel," beginning at 7 p.m. at the Peter Jay Sharp Theatre in NYC. Thanks to my mom for catching an ad for this house, the Jackalope Ranch in Pedernales, TX. 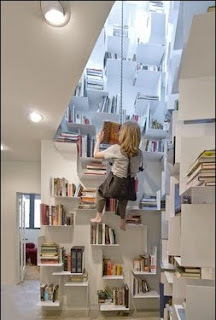 It's got what's described in The Week magazine as a "three-floor library tower accessible via bungee rig." More photos here. Some great news to report: Fine Books & Collections will be returning to print as a quarterly, beginning with an April 2010 issue. The subscription rate will be $25. Current online editor Rebecca Rego Barry will also manage the print edition. I know all who enjoyed the previous iteration of the print magazine as I did will join me in applauding this move! Watch for a book review by yours truly in the April issue, too!